When is a contractor really an employee? 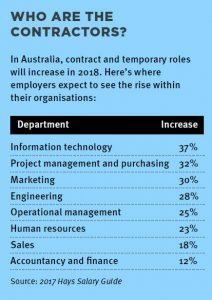 In Australia, 23 per cent of employers say they now regularly engage contract or temporary staff – with another 44 per cent employing them for special projects – according to the 2017 Hays Salary Guide. The Australian Bureau of Statistics estimates there are one million independent contractors currently working in Australia, representing about 9 per cent of the workforce – an increase of 2 per cent in six years. As the number of independent contractors continues to rise, so too does close scrutiny of it by watchdog agencies such as the Fair Work Ombudsman (FWO) and Australian Taxation Office (ATO). In 2018, the FWO has reported that the misclassification of employees as contractors is a persistent issue within many industries in Australia. According to an FWO spokesperson the FWO has found exploitative cases of sham contracting, where businesses deliberately engaged workers as independent contractors, when they were actually part- or full-time employees. The cases involved “very serious, deliberate and systemic behaviour used to gain an advantage over competitors and resulted in large underpayments”. Migrant and young workers, in particular, may find themselves the target of sham contracting due to a number of factors, including reluctance to reach out for help for fear of losing their job, lack of awareness of workplace rights, or language barriers to properly confirm their working agreement. Some instances of misclassifications of workers, though, have been unwitting. For instance, arrangements were either formed in partial ignorance, or began as true contractor engagements that slowly changed – unobserved and undeclared – from contractor to employee. If someone has been engaged as an independent contractor, and the court or the Fair Work Ombudsman determines they’re really an employee, there are provisions under the Fair Work Act 2009, which enable you to be prosecuted for breach of the award, There’s a maximum fine under the Fair Work Act 2009 for a breach of the Act – up to A$63,000 per breach. It may go further than that. Businesses may also be held legally responsible, as an accessory, if a contractor – or subcontractor – is found to be underpaying staff. Unfortunately for businesses and workers alike, the distinction between employees and independent contractors is rarely immediately clear. ATO and FWO websites offer further information outlining the differences between employees and contractors, as well as tools to assist in determining whether a worker is an employee or contractor. Whether you’re a business or a worker, as models of employment change and contracting increases, they should be essential reading. Workers can contact the Fair Work Infoline on 13 13 94. A free interpreter service is also available by calling 13 14 50. Super guarantee charges for not meeting super obligations, comprising: super guarantee shortfall amounts (the amount of super contributions that should have been paid into a complying fund); interest; an administration fee; and penalties up to 200 per cent in the most egregious cases. The Commonwealth Government has recently made a number of significant changes to Australia’s employment laws. These changes took effect on 1 July. While much attention has been given to the recent increase to the compulsory superannuation guarantee, little has been given to a number of equally important changes to your clients’ legal obligations under the Fair Work Act 2009. Penalties of up to $51,000 per breach apply, so it’s vital employers take the time to understand these changes and ensure compliance. Since 1 January 2010, employees covered by the Fair Work Act 2009 and who have worked for an emplyer for at least 12 months and who are responsible for the care of a child under school (or a disabled child aged under 18) have had the legal right to formally request ‘flexible working’. In effect, this means they have had the right to ask, in writing, for their emplyer to consider changes to the way work is performed. For example, an eligible employee could request they occasionally work from home, change their working hours or the days on which they work. Once a formal, written request is received, the employer has 21 days in which to consider it and to respond in writing confirming either their acceptance or refusal. If the request is being refused, the employer has an obligation to explain the ‘reasonable business ground(s)’ supporting their refusal. If you receive a written request from an eligible employee you must still respond in writing within 21 days and either accept or reject the application. The updated legislation now includes a (non-exhaustive) list of the various grounds you could rely upon if rejecting the request. the changes would likely have a significant negative impact on customer service. You should note that these are certainly not the only reasons they can point to when rejecting an employee’s request. Further, they should also keep in mind that only employees who meet the above criteria and who have been employed for at least 12 months have the right to make formal requests. Significant changes have also been made to unpaid parental leave entitlements and, once again, heavy penalties may be imposed against employers if they don’t meet their new obligations. As of 1 July, members of eligible ’employee couples’ can now take up to 8 weeks of concurrent unpaid leave – a significant increase from the previous 3 week limit. In addition, this concurrent leave no longer needs be taken in one single period or commence immediately following the date of birth or placement. Employees with less than 12 months’ service are now also eligible to request a transfer to a safe job during their pregnancy and, if no safe job exists at the time, your client will become obligated to provide the employee with access to unpaid parental leave. In practice, this may present a number of difficulties for your clients, especially those running small businesses. Amendments have also been made to employers’ obligations to consult with employees regarding changes to rosters, union right of entry and time limits for ‘unlawful termination’ applications. Expert advice should be sought if you find youself dealing with any of these situations. Finally, new laws relating to workplace bullying will also take effect on 1 January 2014. These will also have a significant impact. The Fair Work Ombudsman has released the findings of our audit into sham contracting in the cleaning services, hair and beauty and call centre industries. Sham contracting occurs when an employer attempts to disguise an employment relationship as an independent contracting relationship, thereby avoiding obligatory rates of pay and other entitlements. This gives the employer an unfair competitive advantage. The operational intervention began in April in response to intelligence from various sources and concerns raised by key stakeholders, including employee and employer groups and members of parliament. The report states that a number of trading enterprises engaged contractors who should more properly have been classified as employees. While Fair Work inspectors found that most of these arrangements were not deliberate, they did identify a number of employers whom they believe knowingly or recklessly misrepresented the employment relationship to their workers as one of independent contracting. Legal action is being considered in some instances. The Fair Work Ombudsman found misclassification of employees in each of the three industries that were investigated, but does not believe the problem is confined to these industries alone. Misclassification can lead to a contravention of the National Employment Standards (NES), minimum wage orders and terms of a Modern Award or Enterprise Agreement. It can also result in contraventions of employer obligations to provide employee records and pay slips and may expose employers to back-payment of outstanding entitlements. The report calls for employers to exercise a greater degree of care over their contracted labour arrangements. A number of employers had received advice from accountants on how to structure their operations. It appeared the legality or appropriateness of the arrangements under relevant workplace laws was often not considered.